Horse pose gives parents and carers a chance to be active and discover their ‘inner child’ for a moment. Doing horse pose together is a wonderful way to bond with your child. Remember though, horse pose is an active pose. Do check with a health professional before you do the pose if you have any health concerns. If you have low pressure be careful as horse pose can make you dizzy. Check you both have a clear space around you so you can do the pose without bumping into objects or each other. Do the pose on a non-slip surface (a non-slip mat, an area of carpet or outside on grass)! Take off your shoes and socks. This will ensure that you both slip less and can do the pose better, because you will be receiving accurate sensory information through the soles of your feet. Bend forward and downwards together, placing your hands about shoulder width apart on the floor in front of you. Don’t bump heads! Make sure your child’s hands are flat on the mat or carpet and their fingers are spread out wide. Keep your elbows straight. 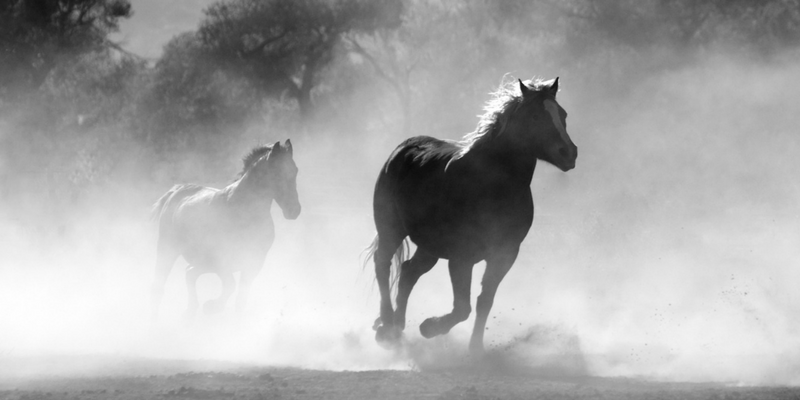 Now start doing little steps, on the spot, with your feet, just like a horse trotting. Keep looking downwards between your legs. Do a few trots and then carefully stand or sit up to have a break. Doing this pose for too long can be disorientating for your child as they are moving their head upside down. As you do horse pose together, make ‘horse’ sounds. 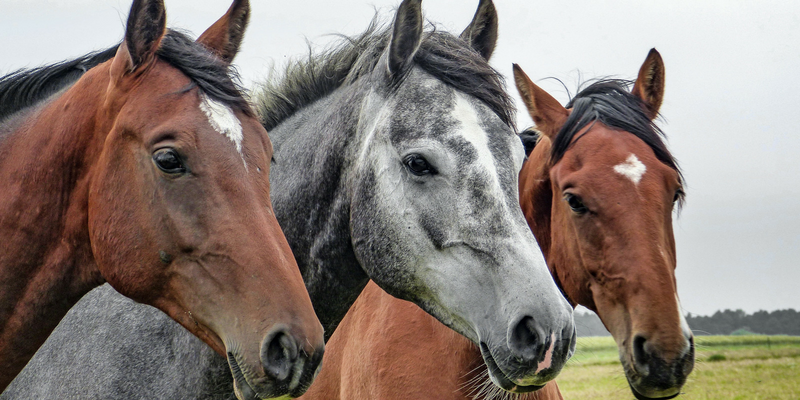 Try neighing and blowing out through your nose! As your child’s trots, or kicks up in horse pose, alternating feet, they will be quickly alternating between their right and left legs, bringing their awareness to both sides of their body. Horse pose is great for balance skills! Especially if your child starts to kick their feet up behind them. Careful though with this movement! In horse pose your child will be taking quite a bit of their body weight through their hands. As they do this they will be gently activating their hand muscles and opening out their hand joints. This activity will bring your child’s awareness to their hands and also help to both activate and relive any tension in their hands. So horse pose can be a godd activity for your child to do if they have been writing or drawing for awhile. See below for further reasons why horse pose is a good movement break. To write comfortably the shoulder muscles need to be ‘active’. Then they can support the weight of the arm, allowing the delicate finger muscles to do the intricate work of holding and manipulating a pen or crayon. If your child’s shoulder muscles are inactive or weak this can lead to hand-ache as they try to use their little finger muscles to ‘hold up’ their arm. When we do movements we often focus on just that – the movement. We forget that with every move we make, we stimulate our senses. A well-known occupational therapist called Jean Ayres, working in the 1970’s and 80’s, recognised the importance of the senses in the development of the child’s brain and coined the term – ‘Sensations are the food for the brain’. And horse pose is indeed a full meal for the brain! As your child does horse pose they will be stimulating both their vestibular sense and their proprioceptive sense. The movement involves big head movements (vestibular sense) so will raise your child’s ‘levels of alertness’. It also involves ‘hard work’ movements, taking weight through the hands and arms (proprioceptive sense) so will help your child to ‘organise’ themselves. If your child does horse pose (carefully and not for too long) they should be alerting their brain – but not ‘over exciting’ it! 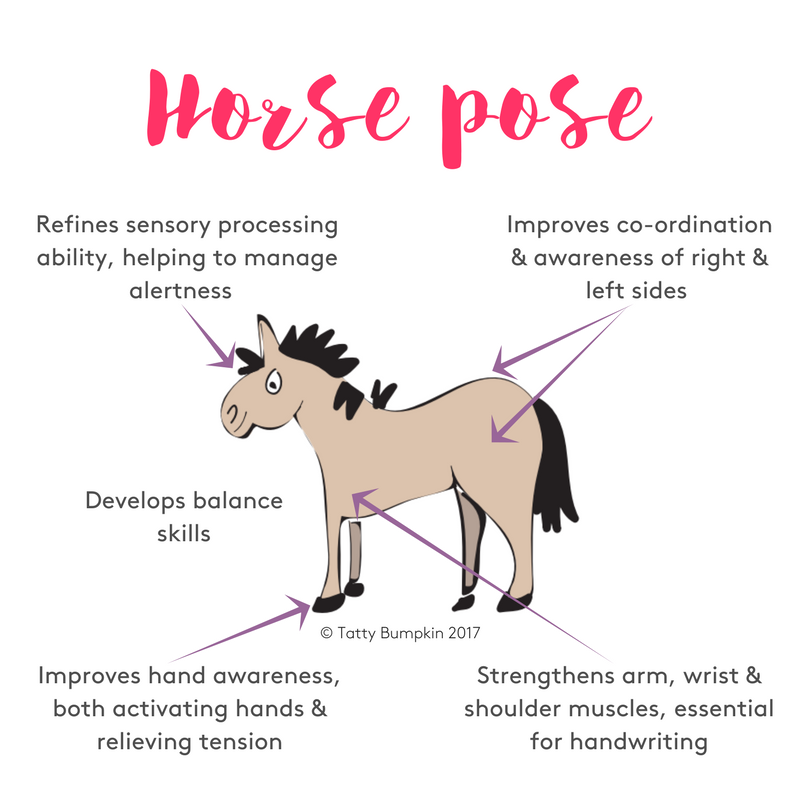 This means horse pose can be good ‘movement break’ for your child if they need to raise their concentration levels after sitting for a while. If your child is older they might want to try kicking their legs up higher behind them. To do this, they will have to take more weight through the shoulders, arms and hands. Suggest that they kick up with their preferred leg first, then try to lead with their other leg. Supervise this activity closely as your child can overbalance, fall forward and bump their head on the mat if they kick their legs up too high. If your child is younger, please watch them closely as they do horse pose. It is a good idea to put your hands around their hips to give them extra support – so they do not fall forwards and bump their head (see picture). 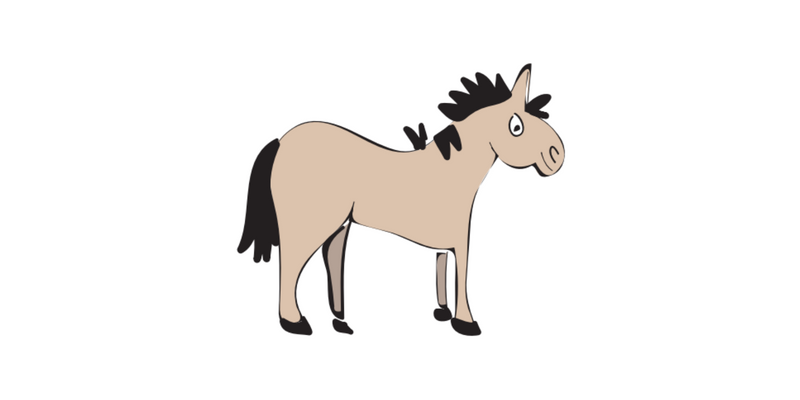 Try making your own pony picture or collage. Spread out a large green piece of fabric for your grass. Then put a strip of blue fabric above it – for the sky. Gather various twigs, for the tree trunks, and place these on your fabrics. Either gather flowers and leaves, or make your own paper ones, to sprinkle all around. 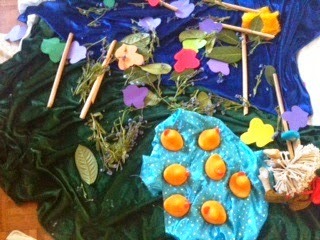 Finally, you can add paper butterflies and/or make a blue pond in the grass for the ducks.